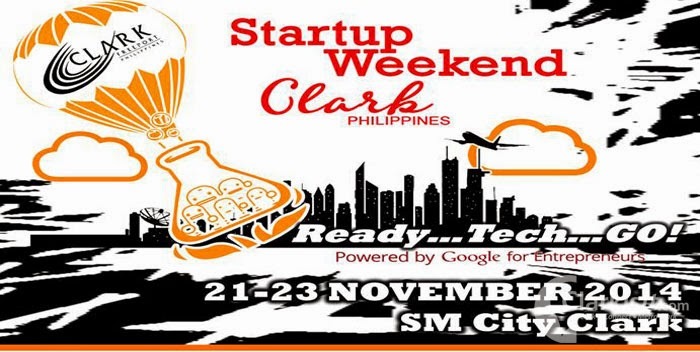 Close to a hundred participants attended the first ever Startup Weekend Clark, a 54-hour tech competition held on November 21-23 at SM City Clark, Angeles City in Pampanga. According to Celine Rivera, MetroClark ICT Council Executive Director, the event was organized with the aim of generating innovative breakthrough ideas from tech communities in the Metro Clark and Pampanga area. “The first ever Startup Weekend Clark was a big success. We are happy to have given an opportunity for developers, programmers, and aspiring entrepreneurs to share ideas, create business prototypes, and initiate new startups,” said Rivera. The event gathered experts from different business fields to coach and mentor aspiring entrepreneurs to launch their concepts and nurture them into successful startups. Topping Startup Weekend Clark is first prize winner JobTags, an app that offers a simple and engaging way to search for a job online by combining the LinkedIn and Jobstreet.com concepts. The second prize went to Let’s Tryke, an SMS app for tricycles on call. Envisioned as #Uber for tricycles, the app was built by Gordon College IT students and faculty. Tapik.ph, which is an online content aggregator and platform for all Philippine news providers and publications, garnered the third prize. Rivera said that the winning teams will get one complete computer set and other exciting prizes that will help them jumpstart their business. Startup Weekend Clark’s panel of judges include Department of Science and Technology, through its Information and Communications Technology Office (DOST-ICTO) Deputy Executive Director Mon Ibrahim, Moray Fleming of Wallem Innovative Solutions, Todd Owens of Owens Asia, Mark Pineda of Scrubbed.Net, and Andrea Francesca Madlangbayan, SM City Clark Assistant Mall Manager. The three-day event began Friday night with the participants forming 10 teams based on the startup ideas they pitched. Each team was given a chance to define and create a prototype for their chosen business models. Coaching sessions then proceeded on the second day as the various groups collaborated closely to build their prototypes. On the third and final day, winners were announced after the final pitching and prototype demo. Some of the other startup innovations spawned in the event include Airmart, which delivers groceries right at your doorstep;SaveJuan, a weather and disaster app; Biyahe Pilipinas and Travelite which are travel portals; and Onemergency, an app providing contact information on fire stations, hospitals, etc. Startup Weekend Clark organizers also gave out special prizes as part of its “adopt-a-startup” program wherein local judges offered special mentorship prizes to selected teams. The mentorship prizes were awarded to JobTags, Let's Tryke, and Onemergency, which were given special access to professional support and advice from successful entrepreneurs in their localities even as they continue to work on developing their startups. “Metro Clark currently does not have formal incubators so these mentorship opportunities are critical to the survival of these startups,” said Rivera. She added that these startups can also apply to Manila or Singapore-based incubators at the appropriate time and if suitable. Madlangbayan, SM City Clark Assistant Mall Manager, also offered to introduce the members of the team Airmart to the mall’s grocery tenants. Startup Weekend Clark was organized by Metro Clark Information and Communication Technology Council in cooperation with TechTalks.ph and with the support of the DOST-ICTO.